Stories about the North American Wild Turkey (Meleagris gallipavo) and its domestic cousins abound as Thanksgiving approaches. And certainly this impressive and economically important bird is worthy of attention (please see articles linked below). But there is another turkey – and only one – a breathtakingly beautiful bird that is largely overlooked by zoos and private aviculturists alike. I had the good fortune of working with this species, the Ocellated Turkey (Meleagris ocellata), at the Bronx Zoo. Bringing to mind a turkey-peafowl hybrid, this fascinating bird is threatened by poaching and habitat loss, and deserves more attention from bird enthusiasts. Today I’ll take a look at its natural history and captive care. The male Ocellated Turkey’s body is clad in a mix of highly-iridescent bronze and green feathers; in the sun they are truly spectacular. The hens are a bit less-brilliant in color, but still very attractive. The blue-gray tail feathers are adorned with large, round blue and bronze spots (ocellus). The bright blue head and neck bear red and orange nodules, which are more pronounced in males. A blue crown, which becomes larger in the breeding season, tops the male’s head; red eye rings develop at this time as well. The leg spurs, used when battling other males, are noticeably larger than those of the North American Wild Turkey (please see photo). Somewhat smaller than their North American relative (and much smaller than barnyard versions! ), males usually top out at 11-12 pounds in weight. The Ocellated Turkey is found in Mexico and Central America, where it ranges from the Yucatan Peninsula to central Belize and northern Guatemala. Ocellated Turkeys inhabit brushy grasslands, thorn scrub, open lowland forests, rainforest edges, riverside thickets and abandoned farms. Open habitats are utilized during the breeding season, but they never wander far from thick cover. The natural diet appears to be as varied as is that of the North American Wild Turkey. Leaves, berries and other fruits, nuts, seeds, small snakes, lizards, spiders, worms, insects and other invertebrates are taken with equal relish. Field studies indicate that chicks subsist largely upon insects, but captive born youngsters take a wide range of foods. From egg to adult, Ocellated Turkeys face predators ranging in size from coatis and snakes to pumas and jaguars. Consequently, they remain wary and alert even after several generations in captivity. I kept Ocellated Turkeys in heavily planted-outdoor exhibits provisioned with heated shelters. They were somewhat high-strung and always on guard, but did fine as long as dense cover was available. I do not believe they would thrive in bare exhibits. Although some European zoos allow their turkeys outdoor access on warm winter days, those I’ve worked with seemed quite cold-sensitive and were kept indoors during the late fall and winter. Ocellated Turkeys are not fussy eaters and readily accept commercial turkey chow, but I strove to provide a great deal of dietary variety. They especially favored the crickets, mealworms and other insects I tossed in most days, and continually searched the leaf litter for snacks at other times. Breeding in zoos is sporadic, with more success being had in Europe, especially Belgium, than in the USA. They are rare in private collections, and remain very expensive. Ocellated Turkeys are classified as “Near Threatened” by the IUCN and are listed on Appendix III of CITES. They are hunted, often illegally, throughout much of their range. Males lose much of their characteristic caution during the breeding season, and make easy targets as they display in open grassy areas. Habitat loss to logging and agricultural expansion also threatens their survival. Even in undisturbed habitats, their apparent “tastiness” to non-human predators results in significant losses. One study found that 85% of the chicks hatched in June did not survive until September; 30% of the breeding hens were taken by predators during the same time period. The Ocellated Turkey’s stronghold appears to be in the Maya Biosphere Reserve of Guatemala and northern Belize, but detailed surveys are lacking. This month (July, 2014) the Netherlands became the first country to outlaw the hand-rearing of parrots. The law covers all Psittacines, including parakeets, cockatoos and lovebirds, and imposes fines and/or jail time upon violators. Bird breeders and private owners may not remove nestlings from their parents before the young are feeding on their own and otherwise independent; species-specific time frames are set out in the legislation. The process of hand-rearing, long touted as a means of bonding parrots to people, has been linked to a host of behavioral and health problems. While several countries extend similar protections to young dogs, cats and monkeys, the Dutch law is the first to include birds. Bird breeders and owners worldwide are lining up for and against this ground-breaking law, and discussions have sometimes become heated. Where do you stand? Please let me know by posting your thoughts and opinions below. While hand-reared parrots initially bond readily to their caretakers and so seem ideally-suited for life as companion birds, research conducted at the Netherlands’ Clinic for Birds (please see article below) suggests that problems often arise as the birds mature. 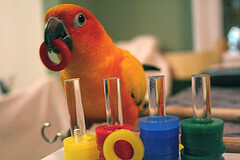 Groups that have long lobbied for this law, including the Dutch Parrot Foundation, argue that parent-rearing is essential to such intelligent, social birds. Weakened immune systems, certain diseases, severe behavioral problems and other concerns have been linked to hand-rearing. Also, parrots that bond with humans often refuse to accept mates once they mature. Throughout my career, I have seen this occur in animals as diverse as Great Horned Owls and Gorillas, and it is generally irreversible. This phenomenon even extends to birds fostered by closely-related species. In zoos, the eggs of rare birds are sometimes pulled and placed below a hen of a related, more common species. This causes the rare female to produce a second clutch, increasing the potential population. Such chicks often identify with their foster species…in some cases imitating their call and preferring that species as mates. There are no set rules…Pink Pigeons fostered by Ring-necked Doves did fine for us at the Bronx Zoo, but human-reared birds of many species proved to be poor breeders. Does Hand-Rearing Perpetuate Bad Husbandry? While critics of the new law abound, advocates believe that other countries will follow the Netherlands’ lead in time. I found one point raised by the Dutch Parrot Foundation to be particularly interesting, and in line with what I’ve observed over many decades of animal-keeping. When environmental conditions and health are not ideal, captive animals curtail reproduction. With very few exceptions, this holds true for all taxa, from invertebrates to mammals. And when captives do breed, many species will refuse to raise the young, or may even kill and consume them, if all is not well (for example, many first-time hamster keepers learn the hard way that disturbing a new mom by frequently checking her litter invariably leads to disaster). Strange as it may sound, such behavior makes good sense, from a survival standpoint – parents do not waste time and resources caring for offspring that will not likely survive. The same holds true with parrots. Some of the law’s opponents claim that hand-rearing saves lives, because so many parrots refuse to incubate eggs or abandon their chicks. However, the Dutch Parrot Society maintains that a pair’s failure to care for their chicks is a clear indication of bad husbandry practices. A poor chick-rearing record should be seen as a call for more research and better living conditions, not as an impetus to remove the chicks from their parents. Viewed in this way, one might say that chick-pulling allows sub-standard husbandry practices to continue, and does little to add to our understanding of certain species’ needs. According to those who favor the law, once parrots are provided with a proper species-specific diet, suitably-sized and designed enclosures and other appropriate conditions, both breeding frequency and parenting success will improve. My experience with the Bronx Zoo’s huge, diverse bird collection, and with many other animal groups, also bears this out. Well, I’m not sure how this information will be received, but I’m betting there will be sparks! Please post your thoughts below. 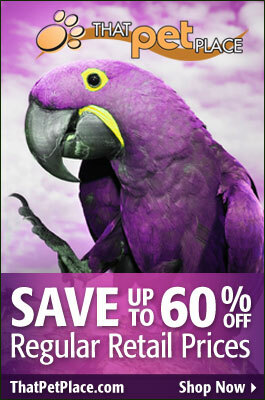 Think you have a smart parrot? That may be, but a Goffin’s Cockatoo has recently set a new standard by which bird – and indeed animal – intelligence will be measured. Pipin, as the avian genius is known, demonstrated a skill previously known to exist only in chimpanzees. Using sequential problem solving abilities, Pipin (and, after a time, several of his “lab partners”) figured out how to open 5 different locks – each of which jammed the next lock, and each requiring a different physical maneuver – in order to obtain a treat. Mastering the task, which took nearly 2 hours, required the bird to solve problems, remember what he learned and apply it to a different task, and focus on a distant reward…and, I assume, to have patience! The fascinating research into Psittacine intelligence was conducted at the University of Vienna, and published in the journal PLoS ONE (8(7): e68979;doi: 10.1371/journal.pone.oo68979; 7/13). Ten Goffin’s Cockatoos were presented with a box containing a treat. The door to the box was transparent, so that the birds could see the treat (a nut) within, and was secured by 5 locks. Lock number 1 had to be opened before the cockatoos could get to lock number 2, which had to be opened in order to gain access to lock number 3, and so on. Opening each lock required a different physical action – removing a pin, screw and bolt, turning a wheel and shifting a latch. Without prior training, Pipin opened the box in less than 2 hours. The article stressed the speed of his problem solving, which of course is impressive. But I’m equally surprised by the fact that he could keep at a problem for such a long time. As anyone who has tried to train parrots (or toddlers!) knows, their attention spans are relatively short (or so I thought…maybe birds and 2-year-old children have been tricking me all along!). Five other “less-cerebrally-gifted” but still quite intelligent Goffin’s Cockatoos solved the puzzle after watching Pipin perform or following exposure to each lock individually. Sequential problem solving requires a parrot or person to remember and then apply what has been learned, and to work for a distant reward. In order to test these and related abilities, the University of Vienna researchers scrambled the locks, so that number 3 was first in line, followed by number 5, etc. Once a cockatoo had mastered a lock, it rarely became confused if the lock’s place in the puzzle was changed. And locks that were disabled by the researchers (left unlocked) were given a quick glance and then ignored. How Bright is Your Parrot? I’ve spent a lifetime working with parrots and other animals, yet never fail to be amazed by stories of learning abilities relayed to me by readers and zoo visitors. Please be sure to post your own “smart bird” tales below! Hand-rearing a bird that seems abandoned is an extremely difficult process. If you’ve observed wild baby birds in their nests – calling continually for food and greedily gulping down whatever their parents bring, this may be hard to believe…seems most would be very easy to satisfy. However, there are a great many factors to consider, fine points that are not well-known and potential health problems that are all-too-common. As a lifelong zookeeper and licensed wildlife rehabilitator, I’ve raised many nestling birds representing a huge array of species – and none were easy! Today I’d like to highlight some important points one should consider before taking on the very tedious job of raising a young wild bird. Note: The following information is general in nature, designed to provide an overview of what to expect. Please post below for detailed advice on hand-rearing specific types of birds. Immediate and Future failures – Be Prepared! Those who take in orphaned wild animals of any type are generally kind-hearted souls who take losses personally. But death and failure cannot be avoided, and may be the rule rather than the exception. Baby birds that fall from the nest often have internal injuries, and are usually weakened by parasites, lack of food, and exposure to the elements. Turning the bird over to an experienced rehabilitator is usually the best option; please post below if you need help in locating a local rehabber or veterinarian. If they survive, hand-raised wild birds often have difficulty with socialization, and may be rejected by others of their species. A Great Horned Owl I helped to rear tried to feed mice to its keepers when it entered breeding condition, but fled from other owls…a good educational animal, but not suitable for release. Captive-reared birds may lack survival skills, and their immune systems may not serve them well under natural conditions. Until fully-feathered, young birds typically need to be kept at 85-90 F. Commercial rearing foods used for seed-eating hatchlings must be properly prepared and cooked, then served at the ideal temperature (generally 101-104 F) many times daily and, at least early on, 1-5 times each night. While it appears that parent birds merely stuff food down their chicks’ throats, feeding is actually a very delicate procedure, and small mistakes can lead to death by asphyxiation or infection. As birds open their mouths for food, the glottis closes and the food winds up where it belongs. Weakened nestlings that do not beg are often “force-fed” by well-meaning rescuers. Food and liquid provided thus usually wind up in the lungs, resulting in a quick fatality. The condition of the chick’s crop must be monitored carefully, even if the youngster is eating well and appears hungry. Due to the nature of artificial diets and other factors, crops may fail to empty or retain air. Infections inevitably follow. Dehydration is common, especially at typical household humidity levels and for birds that are not feeding eagerly. The water content of your bird’s food must be carefully monitored and adjusted as the bird grows and different foods are offered. Wild nestlings are provided with dozens to hundreds of different food items by their parents. The diets of most, even those species that are confirmed seed-eaters as adults, are comprised largely of insects, spiders and other invertebrates. The nutrients they contain are impossible to duplicate artificially. As a consequence, birds that survive hand-rearing often exhibit growth and immune system abnormalities. Transferring a youngster to the adult diet can be tricky, and can result in losses even when all else has gone well. Depending upon the species, an entirely new diet or additional food items will be needed. Some switch from insects to seeds and/or fruit, insect eaters and birds of prey begin taking whole animals, and so on…these drastic changes must be accommodated by the bird’s digestive system. Nestlings that have not been properly nourished may not be able to adapt.